The school I teach for took a field trip to the National Museum of National History in Washington D.C. in the beginning of June. Little did they suspect (actually they totally knew) I was going to have as much fun, if not more fun, than my students. Frustratingly, the museums normal fossil hall, the David H. Koch Hall of Fossils, was under construction and will be open in June of 2019. However, the museum knew that if they had no dinosaurs at all to show visitors there would be violent riots so they set up a great temporary exhibit, The Last American Dinosaurs. Let's check it out! As the title suggests, The Last American Dinosaurs showcases the creatures that lived at the very end of the Cretaceous period, called the Maastrichtian era, between 68 and 66 million years ago, from what is now Western North America. This area is referred to as the Hell Creek formation. These were the dinosaurs that suffered as a result of the famous meteorite hitting the earth, causing the extinction of the dinosaurs...but not really because birds are still alive. A lot of the most famous dinosaurs lived in the United States during this time, so it was a good opportunity to show some fossils of them, alongside some not-so-well-recognized fossils from plants and other animals that also lived there. The first thing you see when you walk in is a cast skeleton of my favorite dinosaur, Triceratops horridus! I recognized this individual from this museum's original fossil hall, which I visited several years prior. Casts are great to use as displays since they are lighter and therefore can be more easily mounted, less fragile and therefore are less stressful to worry about being mounted, and less valuable than the actual fossil and are therefore less of a tragedy if broken. Finally, this lets paleontologists study the real bones in the lab behind the scenes, while the public can still enjoy what those fossils look like when they visit the museum. Everybody wins. The Triceratops mount is the first thing you see when you walk in this exhibit. Next to the full Triceratops mount was a glass case that showed the inside of this magnificent dinosaur's skull. This allowed visitors to see the size and shape of what the brain would have been relative to the rest of the skull. It also showcased the ball-shaped section of bone on the back of the skull, that fit into a socket in the first neck vertebrae. This ball and socket mechanism gave Triceratops and other ceratopsids a wide range of flexibility with their huge skulls. Inside of a Triceratops' skull. On the other side of the skeleton was another glass case showcasing casts of juvenile Triceratops and what would be considered a baby Triceratops. Triceratops is known from a wealth of specimens of varying ages. We now know that as a youngster, this dinosaur's horns started small, and curved upwards. As the dinosaur continued to grow and mature, the horns began to grow forwards. This may have been to help signal to members of its own species whether or not the animal was mature, and therefore ready to mate or engage in intraspecies combat, in which case, more forward-facing horns would be more useful. Few creatures cuter than a baby Triceratops. Something about those little nub horns. You can't have an exhibit on the latest Cretaceous without a Tyrannosaurus! This exhibit showcases a cast of "Stan", a Tyrannosaurus who's original skeleton is at the Black Hills Institute in South Dakota. This Tyrannosaurus is famous for the teeth being exceptionally long, although this may be due to them partially falling out of their sockets after the dinosaur died. A replica of "Stan" is the center of the exhibit. Edmontosaurus annectens (formally known as Anatosaurus and Anatotitan) is represented by a skull. This giant plant eater is known from some beautifully preserved specimens, that even include skin impressions. The display here focuses on their eating habits, and the fact that they had hundreds of small teeth which were adept at pulverizing tough plant material. Can't do an exhibit about the Maastrichtian without Edmontosaurus annectens. This exhibit doesn't ignore the smaller, less recognized creatures of the latest Cretaceous, however. They have a wall featuring some of the mammals, a salamander, and even plant fossils, alongside the dromaeosaurid dinosaur, Acheroraptor, on display. Despite the fact that large dinosaurs are the most exciting to most people, it is also exciting to learn about other aspects of the environment they lived in. Mammals, although restricted to below a certain size range during the Mesozoic, were still extremely successful, widespread and in their own right, diverse. Plants are fascinating to think about during this time and certain species are still very mysterious as to how they would have looked and grown. Amphibians have been around since before reptiles, let alone dinosaurs, and are still going strong in many environments today, which by itself is awe-inspiring. Wall of unsung Maastrichtian heroes. Lastly I'd like to show this little infograph they have hanging on the wall. It features silhouettes of all the nonavian dinosaurs that coexisted in this environment that we know of which is pretty cool and informative considering lots of people falsely assume all dinosaurs coexisted with each other. That being said, it appears they are still missing a few, like Dakotaraptor and Dracorex. (before you try to tell me Dracorex wouldn't be on there because it is thought to be a juvenile stage of Pachycephalosaurus, note that Stygimoloch, also a perceived growth stage of this dinosaur, is featured. So there.) I also couldn't help but notice that the Tyrannosaurus and Triceratops horridus appear to be taken from the original Jurassic Park concept and promotional art by Crash McCreery. 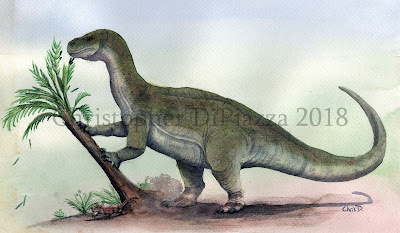 Mark Klinger's image of the oviraptorosaur, Anzu is also there. A number of the other images look like they were taken from other artworks I've seen before and various stock images from the internet. To the folks at the National Museum...all you needed to do was email me and I would have gladly taken the job as illustrator for you! This was the one disappointment in an otherwise great exhibit for me. Overall, I think this was a cool exhibit that does a great job temporarily satisfying anyone's appetite for paleontology when they visit the National Museum. It does a good job educating the public on their old favorite dinosaurs, as well as introducing some lesser known creatures that deserve more attention. That being said, I am still really looking forward to seeing what is in store when their permanent fossil hall is completed! This week we'll be checking out a newly discovered dinosaur that was a giant long before we thought giants existed. Make way for Ingentia prima! Ingentia was a plant-eating dinosaur that lived in what is now Argentina during the Late Triassic Period, between 210 and 205 million years ago. Sadly, only a partial skeleton is known so far from two individuals, including vertebrae, shoulder blades, and arm and hand bones. However, this material is enough, with the help of referencing other kinds of dinosaurs that are similar and closely related, to estimate Ingentia was between twenty five and thirty three feet long from snout to tail. This makes Ingentia the largest known animal in its environment. The genus and species of this dinosaur translate to "First Huge One". Ingentia prima knocking over a tree fern (and scaring the daylights out of a sphenodontid) in watercolors by Christopher DiPiazza. Ingentia belonged to a group of dinosaurs called the sauropodomorphs, which which are famous for having long necks and eating plants. Brontosaurus, Apatosaurus, Diplodocus, and Brachiosaurus are probably the most recognizable members of this group. These famous dinosaurs are from the later major branch of the sauropodomorph tree, which flourished in the late Jurassic Period, growing to gigantic proportions and sporting column-like legs and feet. Ingentia, however, appears to have been from the earlier branch of this major group of dinosaurs that flourished in the late Triassic and early Jurassic periods which were overall smaller in size. They are sometimes referred to as the basal sauropodomorphs, or prosauropods. The most famous member of this group of dinosaurs would be Plateosaurus. (Which is sadly still not nearly as famous as the late Jurassic giants mentioned earlier.) Prosauropods had five fingers and three claws on each hand, and many species walked on their hind legs. Since Ingentia appears to be from the basal sauropodomorph group, it supports the notion that extremely large body size in dinosaurs not only started much earlier than we thought, but it also occurred twice in the sauropodomorph family tree. Looking at cross sections of Ingentia's bones, paleontologists could tell that it was growing in spurts throughout the year, probably based on the seasons. During the times when food was more abundant, Ingentia grew rapidly. It's growth slowed down when resources were less available. This is in contrast to the growth patterns we see in the later kinds of sauropodomorphs which grew constantly, but at a more steady pace. Figure from Apaldetti's paper describing Ingentia showing the known bones. Ingentia's vertebrae show that they would have had air sacs in them in life, like modern birds have. Ingentia wasn't using air sacs to fly, obviously. They would, however, be great adaptations for staying relatively light for the animal's size, which allowed it to grow much larger than a creature that had solid bones. This is why the largest dinosaurs exceed the largest land mammals, which have solid bones, by so much. A mammal beyond a certain size would collapse under its own density, while a dinosaur, which is much lighter for its volume, could grow much more before hitting its threshold. Air sacs also help keep the inside of the body from overheating, and help keep a more constant supply of fresh oxygen circulating throughout the body. Ingentia has been depicted walking on all fours in life a lot so far, but since most of its hind limbs have yet to be uncovered, we still don't know for sure if it could also walk on just two legs, as well. There is even a chance it was an obligatory biped, only walking on its hind legs, like its later relative, Plateosaurus. That is all for this time! As always feel free to comment below! Apaldetti, Cecilia; Martínez, Ricardo N.; Cerda, Ignatio A.; Pol, Diego; Alcober, Oscar (2018). "An early trend towards gigantism in Triassic sauropodomorph dinosaurs". Nature Ecology & Evolution.